My backpack. But as of spring 2018 the left side of my Eagle Creek backpack is much more organized now. I pretty much started thinking about what I’d bring on my next trip about a week after arriving home from my last 1½ year trip. This time, although I try to write about each item while I’m traveling, I’m also creating my packing list online here to share with you. I started this page March 2017 and it is an oft-changing work in progress for now. Below, you’ll see December 2017 updates for almost every item. I’m also adding my 2018 packing choices. I started this list while preparing to attend the International Travel Goods Expo, in Las Vegas, an excellent opportunity to learn about worthwhile travel products. It was an honor to be there, to meet manufacturers and sales teams and to select important items. I have several new options to consider for travel now. I also know of several options for those of you who wish to travel independently short or long-term in styles other than mine. I will be sharing them with you soon. The wrong pack can make your life miserable (as can over-packing). 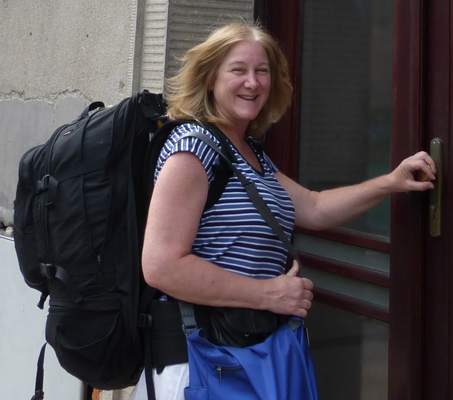 When I hit the road in 2011, I used the pack I’d been using for US business and fun trips — an EagleCreek Cordura 63-liter suitcase-style backpack that I bought in 2005. It was the best pack available for me in 2005, but materials and models change over the years. It was time to look again. Can a woman who is living in the business world as she travels fit into one bag and still have a respectable wardrobe, nice hair, and enough tech to work? I’ve pulled it off with a too-heavy 63-70 Liters but I will never travel that heavy again! My new self-challenge — to downsize to a 50L carry-on. Part of my weight came from the tech I carried to be ready to do presentations or help people with their Macs so I will be dropping some of that. And I am succeeding! Eagle Creek Expanse Convertible 29” — with wheels and backpack straps providing 4760 cubic inches (70 cubic liters). This bag enables me to carry enough to appear as a respectable woman and carry some light weight luxuries. At 9lbs 7oz/4.3kg it’s heavier than my previous bag so I need to keep the contents more than 5 pounds lighter than on previous trips. Because it has sturdy, durable rollerblade wheels, I won’t have to carry it all the time. It would be nice to be able to buy gifts or warm clothing along the way and have them fit in this bag. However… I would always have to check it when I fly and I may fly discount airlines more often on this trip. Eagle Creek Expanse Hauler — a 2lb 1oz (0.95 kg) carry-on size backpack/duffel. It is far more elegant looking than a duffel bag. It’s 3050 cubic inches/50 cubic liters and definitely good for travel where you stay in hotels. It lacks a hip belt. However, I made my own. This bag does require a small supplemental bag for cold weather clothing. 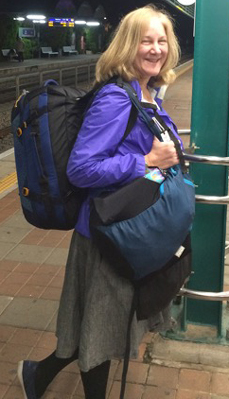 2014 — Carrying EagleCreek backpack & a Colombia day bag, but. I also had the same ChicoBag day pack. 2017 — Carrying EagleCreek Expanse Hauler Duffle backpack and the same ChicoBag day pack, plus not-full ChicoBag handbag. As a day pack for a few years now, I have used a new ChicoBag Travel Pack rePETe. My last one lasted so well for years so although still reliable, I purchased a new one to start fresh for my 2017 travels. 17″h x 10″w x 6″d (25cm w x 43cm h x 15cm d); 915 cu in / 15L; 7.2 oz / .45 lbs. It’s easy to hand wash and hang it to dry quickly. The daypack/carry-on supplemental backpack I have decided on for 2018 travel is the Matador Beast28 Packable Technical Backpack, which is 20″ x 13″ x 10″ so I’ll be sure to not fill it completely when I fly. This is a super-durable bag that handles 28 pounds! I’ll never have to worry about stressing it as I travel. It weighs 20oz as opposed to the former bag’s 7.5 ounces but as this bag is now a constant necessity, I’m fine with that extra weight. One thing I need that this bag provides are thinner flexible shoulder straps. This enables me to have my Eagle Creek Expanse Hauler Duffel on my shoulders and still be able to place the daypack over a shoulder. The other day packs I’d consider bringing and would likely welcome is one of the waterproof-ish daypacks by Sea To Summit, Matador Daylite 16 Daypack (16L capacity, handles 20 pounds, is 4.1ounces/.256 pounds, 17×11.5×6 inches.) or Lewis N. Clark (Electrolight ). Or, not waterproof, but maybe good may be the Eagle Creek Packable Daypack (13L, 5 ounces). I have learned to always have a regular handbag for when I want to go out like a normal person. For this, I found the ChicoBag Hobo which is so lightweight that I get to have that luxury! Sadly, they discontinued it. Luckily, I’d just bought a new one and it’s black so much more versatile than my original purple one. I have never found anything as good for the money. Here’s what I wrote about this. [Update February 2018: There are tears at the bottom of the new black handbag. It’s simply not made from the same great ripstop fabric. I am still sorry they don’t make this type bag any longer as nothing comes close to it, but my days at a ChicoBag fan are over. ChicoBag Sling bag — for my days or shopping or a fast couple of backpack-less days away. Bottle Sling rePETe — for carrying a water bottle around on hot days. Luckily, my HydraPak Stash 1L water bottle fits in it. Snack bags by ChicoBags — reusable bags so you can carry nuts, sandwiches, etc. Also great to wrap your foil-wrapped leftovers so you can take that “doggie bag” when you dine out. (I have another favorite reusable snack bag and it was my original but sadly, the company went out of business. Sea To Summit Lightweight Dry Sack — for going on boats or walking in the rain. To go on a boat, my laptop goes in one bag, then that bag goes into another. For rain, I put the large one into my daypack or sling bag. Packing cubes to hold my clothing within the backpack (or any suitcase). Since 2011 I have been using Sea To Summit’s Travelling Light ™ Garment Mesh Bag and an Eagle Creek Original Pack-It Cube. This time I will only take light fabric and a newer compression style of packing cubes. I’m working with 2 Medium/aka Full EagleCreek Pack-It Specter™ packing cubes right now. Switching to their new Pack-It Specter™ Compression cubes would reduce up to 2″ height per cube which would be handy. At 1″ compressed, that’s the shortest height packing cube I have found. Trying to fit everything into my tiny space, I believe the compression would be very handy. Both of these styles though, only open on one side. LEWIS N. CLARK’s ElectroLight Expandable Packing Cubes are also light weight and are approximately the same size and compression. Plus, their tops open, making packing and selection easy. Laundry bag. For all the previous years, I have been using a Tide laundry bag.I may sew my own so it’s light-weight and closes well. But for travel in a one-compartment suitcase, I want a waterproof soft container. I am trying the medium-sized Innate Caravan Compartment. Plastic zip-seal bags. In the past, I have used some for compressing undies, socks, etc. as they also keep them dry and clean. However, I may switch to packing cubes. Throughout all of my travels, I’ve had my original down mummy sleeping bag. Warm and comfy, it was also my “blanky” — a bit of home wherever I slept. I even brought it to 5-star hotels as my blanket. But after my 2104-2016 trip, it’s no longer viable and I have found a very lightweight actual blanket. Double Black Diamond Packable Down Throw, a 60″ x 70″ ultra light, ultra warm blanket of 700 fill powder. Costco carries this great blanket for $19.99 each July or September and as a 2-pack online. I’ve seen them other places for up to double the price. I have found other brand similar blankets but smaller for more money. Hard plastic container for my toiletries. Since the 90s I have been using the same AmericanMaid/AmericanMade brand container and it remains fabulous and tight-closing without bulk, but they seem to not make it anymore. Brincatti Refillable Bottles (usually 3). I’ve been writing about them here for some years now. Round hair brush — I tried to live without it but won’t do without it again. I have to live without something else instead. Hair dryer — small, light-weight. Dual voltage. I’ve decided this is no longer a luxury. Washcloth — Fast-drying, very light-weight, durable, long, washable. Preferably not polyester as was Target’s The Bathery washcloth that otherwise was perfect for the 6 months I have used it so far. Ear plugs. 3M Disposable Classic Earplugs remain my favorite. They last quite a while, are comfortable and block enough sound. Sleeping mask. I’ve loved my Nidra Sleep Mask. However, the heat-fused fabric loses to nightly use and being tossed into my backpack for over 6 months. I am trying a couple more now. Toothpaste in 3oz screw-top tube. When checking a bag, I always get the size tube that best fits into my great toiletries hard case, but when traveling with only carry on, we need to respect the 3.4oz/100 ml limit. For this trip, I found Aquafresh has a 3oz/85g tube. Towel — the Matador NanoDry™ travel towel because it feels nice, absorbs brilliantly, is incredibly thin, dries quickly, doesn’t smell after 2-3 weeks of use so far, and isn’t that horrid nails-on-chalkboard microfiber. Crystal Body Deodorant Stick, travel size. My article here. Track II razor with refill blades — because it saves room and I detest “disposable” plastic that kills our planet. Cocofloss — the only dental floss worthy of space in my travel bag! There’s no other floss as space efficient because no other floss does so much. It’s easy to get by with smaller pieces, giving me 2 times the usable floss per container. (I am taking 4 with me next time.) Normally, I’d buy items like this as I travel. Honeybee Gardens Truly Natural Mascara ($12.99) — a lightweight, minimal container, stays on, doesn’t require makeup remover. I’ve used this for years and regret purchasing/using any other. Eyeshadow that’s cream in a tube. Never a powder. Lip stain — trying Elf because it’s just $2 and is small enough. It really colors! Cheek color to be determined. Sarong — a regular in my life since 2011, I have written about it. Cardigans (2) — a cardigan turns a short-sleeved shirt into a long-sleeved garment and act as a light jacket. Navy blue and black. Tops — cotton or silk. How many of them is to be determined. Skirts with pockets — 3. One below-knee, one knee-length. Cotton. I sewed my own. 3rd is knee-ish slanted hem black dress skirt with pockets. Dresses — my preferred garment. Frankly, I’d rather only have dresses, but long pants are necessary. Lightweight zipperless jeans or Jeggings — not sports pants. Just one for colder weather. Lightweight soft zipper/buttonless jeans, light blue. 1 pair. Socks — specifically one pair of low-cut Travelsox. I’m actually not bringing sneakers but these socks are just-in-case. Lightweight underwear that dries quickly. Lightweight sandals with an ankle strap. I found very light cork-bottom Rockport sandals, the Keona Flower T-Strap, in a fits-all-outfits neutral color! I love that my feet fit into the bottom which protects toes. I found them at a Rockport outlet, paying under $40 for them. However, I am finding the top of the sandal becomes sweaty quickly, maybe because it is a large area or perhaps because it is man-made material. Time will tell how well they work for my travels. An ankle strap “flip-flop” for water, shower, and daily. I loved both pairs of my Grendha sandals and expect to purchase them again in the future and maybe to try Ipanema. I purchased a new pair of Havaianas on sale. Not sneakers but Skechers GoWalk — but rather than sneakers for more versatility. Packable Raincoat/Windbreaker, Marmot’s Women’s PreCip Jacket. I really prefer a longer coat style and would have loved to try Marmot’s Women’s Mattie Jacket which is 10″ longer and more like a trench coat, better for dresses although it doesn’t get as many great reviews and the hood doesn’t tighten. I found the lighter PreCip first. I was blown away by how lightweight it was and how it covered so many issues, plus it was a great price. (SRP $100.) Both are of the same waterproof fabric. Check out this video review of the Marmot PreCip by Backcountry Edge and this one that shows the features as well. Rain hat that folds small. This was a gift so I don’t have a source. With the Marmot jacket, I don’t really need it though so it may stay home. LIght-weight packable down vest from Costco. It can fit under the raincoat/windbreaker but over most tops. A light-weight packable down coat from Costco — only if I use the larger bag which isn’t looking likely. Backup drives! My WD Passport 500gb has held up beautifully for all of my travels since 2011 and my 2nd drive, a Seagate Slim hard drive is also still in great condition but to not take chances, I am starting with fresh new drives this time. I’ll be taking a new WD Passport (1T so it’s small-ish) as well as a SanDisk Extreme 510 Portable SSD. This 2.98 x 2.98″ x .42″ drive is just 2.72 oz (78.9g) and combines the performance of a portable SSD with all-terrain durability and water resistance! It has 128-bit encryption for password-protection to keep important files secure should it ever go missing. Plus, it clips onto your bag. I am excited to try this new SanDisk Extreme drive. [A friend will have the WD 4T Passport to do backups for me. RadTech ACpower Compact Dual USB Device Charger, Hi-Energy for chargig my USB devices. The original model was with me always during all of these travels and before that. This is a new, stronger model. RadTech Sleevz — long-time favorite because when your computer falls open, it’s hosed. RadTech ProCable UHD Lighting cable — because having your charging cable die on your trip is crippling, I know. New product for me to bring! IK Multimedia iRig Mic Lav — the lav is new for this trip. I have used and relied on their iRig Mic that goes into the standard audio port. I love being able to record my radio shows from my travel iPhones (which always seem to be two models behind). Samson GoMic — this tiny, great USB mic is making its 2nd long-term trip. A great weight/size investment as I record for radio. Cord Tacos — a must-have that are with me daily, traveling or not, since the day I discovered them. [Update December 2017: I love them but the one I have used daily didn’t last 3 months. The metal broke and the plastic seems to have stretched. I will still choose them though. Small Multi-tool — not possible due to the small blade in it. Hand-pressing self-charging LED flashlight — for the just in case. (Several if going to remote villages.) Brand to be determined, but I also have one from the 99¢ Store. I loved my Energizer wind-up/solar but it was stolen and I never found it in a store. Nite Ize Radiant 300 Lumen Rechargeable Lantern — if there is room because I am loving it in my everyday LA life, a new addition to long-term travel, though. Alas, this will remain packed and is awaiting my return in a year or two. Portable battery for recharging USB devices during the day. I love my Innergie PocketCell battery and will likely bring a 2nd one too. Silica packets to dry out electronics due to rain or humidity. I’ve written about this here. Cell phone. An older unlocked iPhone. Having a costly phone stolen or ruined by water is too heart-breaking and I don ‘t want the stress of worrying about that happening. Unlocked so I can buy SIM cards wherever I travel. I buy used phones from friends when they upgrade. (As a tech writer and consultant specializing in Apple, I used to have the newest of everything so I do know that I am missing fabulous new Apple technology.) No one wants to steal my old phone. Cell phone case — must actually be protective! And light. RhinoShield CrashGuard Bumper Case by Evolutive Labs. I mostly live with hardwood floors so this minimal (thus light) “case” has already proven its protectiveness to me well and I love the grip. Because of the grippy bumper, it doesn’t slide out of my pockets by mistake, yet because there’s on back side, it comes out easily when I pull it out. I used to want to hide my Apple logo because of theft but nowadays so many people in every country I’ve been to have iPhones and they recognize that mine is too old for them to desire. I was going to bring a waterproof case as well but I really didn’t have space. Lewis N.Clark Waterseals water-resistant pouch, phone size. Leash It Luggage Leash — because no one wants their luggage to walk away in the arms of another person. Reliefband, original model — so I won’t get queasy when I sail the Mediterranean, which I hope I’ll get to do. If you wish to travel but tend to get motion sickness, Reliefband may enable you to travel more comfortably. It controls air sickness, sea sickness and car sickness. I’ll be reporting on how well it does for me when I sail. Tiger Balm or Vicks VapoRub explained by me here. Hydrogen Peroxide cream antiseptic for wounds — not sold in the US. Water purification tablets. I’m looking into ceramic-based but brought iodine tablets in past years. A $25 Katadyn BeFree Water Bottle replacement filter for my HydraPak Stash 1L water bottle. I have not tried the filter yet but it has been recommended. I love my HydraPak Stash. Burn Cream MD, 3 individual use packets (for when I don’t have an egg handy). Prescriptions that I need. I may be able to get them in various location but I bring plenty just in case. Umbrella — Fjord Folding Trekking Umbrella by Innate is the lightest one I have come across and it appears to be quite durable. This is a first; I am finally giving in and bringing one because I’ve spent so much time in rain while traveling. As a beach blanket or ground cover, I will be sewing a large piece of ripstop nylon. It’s very light-weight and durable. This is a new addition to my packing. If I have space. Safety pins. Learn why I bring safety pins here. TSA-approved lock by Master Lock. This is a new lock for me, lighter and smaller than the last lock I traveled with and still recommend. For years I have traveled with my own DIY RFID shielded card and passport cases. Now I am using Lewis N. Clark’s RFID-Blocking Shields for credit cards which come in a 3-pack and Passport Shield. A large beach ball — for more comfortable sleeping on planes, trains, and buses. I haven’t actually tried this yet, but Joey Green, author of the book Last-Minute Travel Secret: 121 Ingenious Tips by, suggests putting it on your meal tray as a pillow so you can lean forward to sleep. It’s worth space in my carry-on to try it. Sewing kit — home-made. I put this together in 2011 and it’s fantastic. Sink stopper — if I can find a good one again. I’m not sure I’ll find one. The best one I ever found was in Israel but after many months of use, it tore. I’m not sure there is one stopper that is really good for several counties. Stain stick (Tide Stain Stick?) or stain wipes — I have carried packets before but never used them. 1 Pen. Specifically, an Inka Pen + Stylus by NiteIze. It’s a comfortable ballpoint pen that’s supposed to write anywhere. It comes with a quick clip S-Biner attachment so if I clip it into my bag I may actually not lose it. Bottlelight — a cork-shaped USB rechargeable little light that fits into a wine bottle and lights up your room with a romantic ambiance. Not necessary but I like it. Floating light — a cork-surrounded UFO-shaped USB rechargeable little light that floats in water, providing some nice shimmering light. Water magnifies light, remember? I’m not bringing the paper lampshade. I like the sight of the floating light. Waterproof document envelopes — Innate’s Portal Document Pouch — I’m bringing 2 of them. Liquid fabric softener to make wrinkle release spray and a tiny empty spray bottle. I am not bringing laundry soap. For my 1.5 years in Eastern Europe and Israel, I packed 4oz of this Ecos highly concentrated laundry soap and during my year in Central America), I bought a laundry detergent stick in Costa Rica, but shampoo or soap works when laundry detergent isn’t around. If I bring detergent I’ll get another solid stick. I am not bringing sunscreen. The sun energizes our bodies and helps keep us healthy. I have never used sunscreen and never had a problem. I cannot remember ever meeting anyone as brave about travel as you, Deb. And your experiences as a true road warrior are so honest and also informative, it is a pleasure to find you here. And a real, practical help in planning for my own ventures out in the world. Thanks for the heart, humor and information. So many great tips! Thank you so much for sharing all these.